The following is a guest post by Ray Villalobos. Ray is going to explore many of the different varietals of Markdown. All of them offer features beyond what the original Markdown can do, but they offer different features amongst themselves. If you're choosing a version to use (or a version you're offering to users on your web product), it pays to know what you are getting into, as it's difficult to switch once you've chosen and there is content out there that depends on those features. Ray, who has a course on Markdown, is going to share which versions have which features to help you make an informed choice. Markdown has changed the way professionals in many fields write. The language uses simple text with minimal markup and can convert it to a growing number of formats. However, not all markdown parsers are created equally. Because the original spec hasn't evolved with the times, alternate versions like Multi-Markdown, GFM (Github Flavored Markdown), Markdown Extra and others have expanded the language. The original parser was written in Perl. The core features include parsing block elements (such as paragraphs, line breaks, headers, blockquotes, lists, code blocks and horizontal rules) and span elements (links, emphasis, code snippets and images). Since then, the language hasn't been expanded by its creator John Gruber, so a number of additions and implementations have surfaced with different parsers adding support for different implementations as they see fit, or interpreting how certain elements are parsed. There are additional implementations in many other languages, just in case you're looking to implement Markdown in other languages. The core markdown language supports a number of default features that are quite useful. Although different implementations support a range of extended features, they should all support at least the following core syntax: Inline HTML, Automatic paragraphs, headers, blockquotes, lists, code blocks, horizontal rules, links, emphasis, inline code and images. 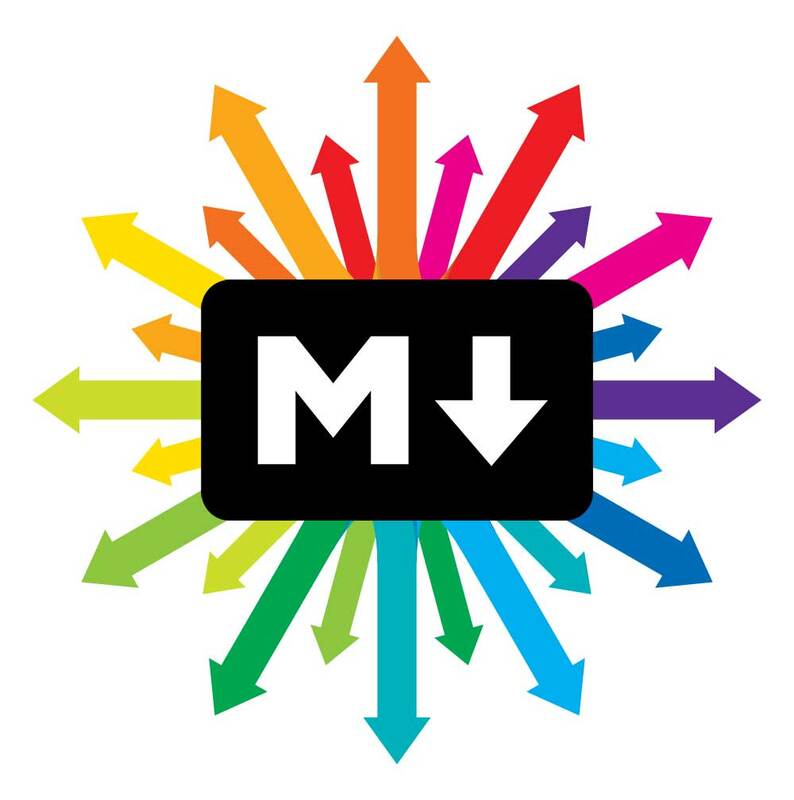 With the many versions of markdown available, a few have had a substantial impact on other versions. So much so that you'll often see them quoted as part of other versions. For example, libraries will mention support of CommonMark, GFM or Multi-Markdown. Let's take a look at what those mean. One of the reason Markdown became so popular with developers is because Github, the open source sharing platform accepted and extended the language with a version called Github Flavored Markup (GFM) to include Fenced Codeblocks, URL Autolinking, Strikethrough, Tables and even the ability to create to-dos within repos. So, when a version mentions support of GFM, look for those extensions to be implemented. Supports: Fenced Codeblocks, Syntax Highlighting, Tables, URL AutoLinking, To-dos, Strikethrough. Recently there has been a move to standardize markdown. A group of Markdown developers joined to create a version, tests and documentation for the language that resulted in a more robust specification for the language called CommonMark. At this time, the implementation added fenced codeblocks, but mostly detailed the specifics of how certain features were to be implemented for consistent output and conversion. A lot more extensions that would bring this more in line with what's available in other languages have been proposed for the future. This format is relatively new and doesn't support a lot of features, but it is actively being developed and there are plans to add many Multi-Markdown features. The first serious projects that extended the language is Multi-Markdown. It added a number of features to the language that is supported by other versions. It was originally written in Perl, like Markdown, but then moved onto C. So, if you see that a project has Multi-Markdown support, then it probably has most of these features. Supports: Fenced Codeblocks, Syntax Highlighting, Tables, Metadata, Fragments/Cross References Links, Footnotes, Strikethrough, Definition Lists, Math. Let's take a look at the features that are available through different implementations. Adding code blocks is great but, by default, markdown interpreters will simply wrap the blocks inside <code> and <pre> tags, which makes the text show up as pre-formatted text in a fixed width font. Some implementations can improve on this by allowing you to specify a language next to the tickmarks and may include a parser that automatically lets you choose different color styles and specify which language your code was written so that the colors are more meaningful. * Some of this support doesn't come embedded into the parser, but is dependent upon other libraries like highlight.js. Writing tables in HTML can be cumbersome. Some versions of markdown can take care of this by letting you add tables with a fairly simple syntax. It takes a few minutes to get the hang of building tables like this, but after you do it a few times, you’ll think of using HTML a bit of a hassle. 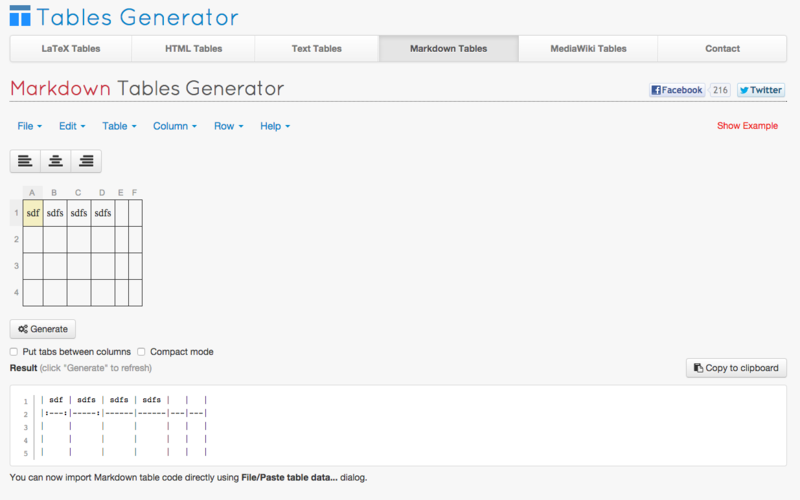 If you need help creating tables, check out this Markdown Tables Generator. Some extensions will let you add meta data that you can use to add information that your app can parse like perhaps choosing a template or setting the page title. Some use the Multi-Markdown structure for this metadata, and others like the Jekyll parser use YAML as the format, which lets you express complex data within this metadata section. This can be a really useful handy feature for app developers. This fairly simple extension allows URLs that naturally occur within your text to convert to links via the parser. This is really convenient and useful in an implementation like GFM, where making URLs clickable without additional work makes for building documentation that's easier to write. With HTML, you can easily create references to within your document by using a hash mark in your anchor tag with the ID of an element on a page. Some implementations allow you to create a shortcut for this type of reference. That's specially useful because it allows you quickly cross-reference your own document without having to write a bunch of HTML. This feature is implemented in very different ways, so you really need to be careful to read the documentation for the specific version you'll be using. You can link to a headline called 'myheadline' in your document using this [My Headline]. The word 'reference' right next to this will get a link that links via an href to the headline above. The headline, in other words, gets an ID that the link points to. Another useful feature is the ability to have IDs within your headlines so that you can more easily target them through CSS. Some parsers will automatically place IDs on all headlines (specially if they support fragments/cross references), so this feature is not always necessary. However, it's nice that some versions allow you to customize how the parser names the IDs, which is sometimes more convenient than auto naming things. The headline above, when rendered by the parser, will have a custom ID that you specify in the curly braces. Footnotes allow you to create links within your document to references that are placed at the bottom of the markdown page. This is different than normal links, which are placed inline within your content. This allows users to view all of the related links within a document in a single section, which is nice sometimes. You can find a demo of a site[^Demo] built with PostCSS in our footnotes, or you can checkout the [^Github Repo] for the project. **Note**: There are many alternate link methods in parsers like Multi-Markdown. Support for these is very spotty in the individual versions. That means that even though the parser touts 'multi-markdown' compatibility, different parsers will implement different types of link references. This includes things like Citations, auto-generated ids in headlines, the ability to create custom IDs, cross-reference links and others. Some parsers will even invent their own link features. This is a Github Flavored Markdown feature that has caught on in some implementations. It adds to-do list markup so that you can create checkboxes next to content to simulate a to do list. If you want to mark text with a Strikethrough, you can use a notation in a lot of versions that wraps the text with the &lt;s&gt; tag. However for a more comprehensive implementation of editor notes, you might want to check out the related format called CriticMarkup. Although definitions lists are not as common as other types of lists, it's a great way of coding certain types of elements in HTML, some implementations add a way to create these in a much simpler way. There are two ways of defining them, depending on the language, using a colon (`:`) or a tilde (`~`), although the implementation with the colons are more common. The ability to create mathematical formulas can be useful to some users, so a language for creating them has appeared within some implementations like Multi-Markdown. Although some languages claim to Support in other languages is available, sometimes through an extension. One thing that you have to be careful about is how different versions handle input and output. Just because a version says it supports tables, it doesn't mean that there's a standard way of creating the code for the tables. Some versions will generate HTML that is verbose and some will render minimalist code. There’s also variations of how things like white space are handled. Some versions will place IDs within each headline and some won’t. This has been one of the concerns that the OpenMark platform tries to address, how to generate consistent output. 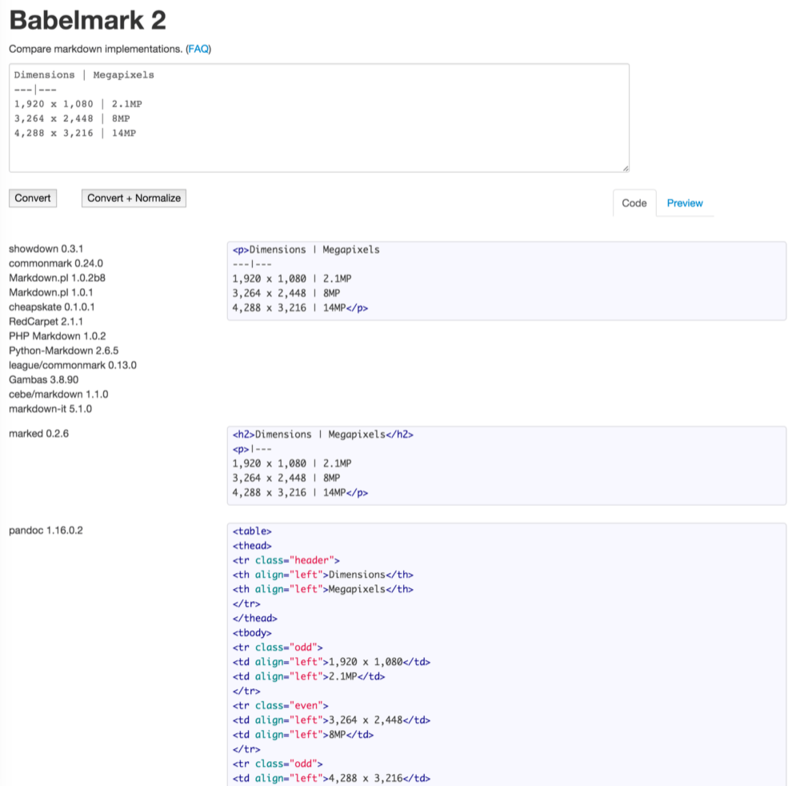 The best way to figure out how the version you’ve chosen handles this is to use the Babelmark 2 test. Paste some code and it will show you how different parsers take care of the output as well as a preview of what that looks like on a browser. There is a handful of other features that I’ve found fairly important to consider. Images are one of the most troublesome thing in markdown — they’re always wrapped in paragraph tags, and it’s nigh-impossible to control them. I’d definitely recommend http://parsedown.org/ for PHP. We use it in Kirby and it’s a fantastic parser with great performance and support. All these are fully customizable regarding the flavor and are quite fast. Good points. I added these to the article. Thanks. I’m quite new to markdown outside of the user end in forums and such, is there a way to, or a parser that can, add specific tags? I’ve searched this question but it’s hard finding the right keywords for an answer. I basically want to be able indicate small caps and other custom character styles I’ve previously defined myself with , which is tedious. I just need to able to attach custom tags and/or classes through markdown. Markdown allows HTML too, so you’re probably in a situation where you need to just drop in <span>s and whatnot with the classes you need. What I love about Markdown is it kinda discourages that by it’s nature (because custom HTML all up in your content is probably going to reduce it’s lifespan), but if you do it responsibly (simple meaningful class names), you’ll be ok. The biggest problem of markdown is that one day you decide to extend it. Then you figure out, that it’s not possible with current parser and decide to write your own :) . Markdown is not very convenient for implementation, and the most of projects allow only renderer (output) customization. While in many cases you may wish to change syntax (input processing rules). IMHO, that’s the main reason why there are so many different parsers. What else “strange” you may wish to have? We needed sync scroll for editor area and preview (see markdown-it demo). That requires sourcemaps (like those you may have for JS). As far as i know, none of existing parsers provide full source mapping info, but some provide such data for block level nodes (paragraphs, lists) and that’s enougth for sync scroll.